This canvas comes in a dark wood frame with linen liner. "The truth and reality of what the apostle James wrote nearly 2,000 years ago is powerfully illustrated for today's Christian family in this beautiful lithograph. The compelling visual message challenges us to pray for our children with a new awareness of the effect our prayers have in heavenly realms. 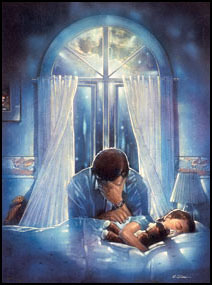 Yes, we are in a war with the powers of darkness for the very spirits of our children; but as Christian parents we can hold each child before the Lord and identify with His glorious victory at Calvary. It is my hope that Spiritual Warfare could be hung in a strategic location to continually remind us to pray." Spiritual Warfare copyright© by Ron DiCianni.